>> Giantex Trampoline Reviews: Should You Buy? The rate at which trampolines has grown is so huge that it has become impossible to find a home without a unit in their backyard. This partly comes from the fact that trampolines encourage your kids to be active and pulls them from gaming and TV. And partly because the trampolines are a great way to exercise for both kids and adults. Now, if you start looking for a great trampoline for your family, chances are high you’ll get Giantex trampoline on your list of recommendations. The brand has been around for some time now and has produced a variety of models into the market. The purpose of putting up this post is to discuss with you if the Giantex trampolines will meet your needs or are worth it. PS: To understand the Giantex products better, we’ll take a look at their two top-rated below. We start with this Giantex Trampoline Combo Bounce Jump which comes in a wide range of sizes to help meet the needs of families with different yard sizes. To be precise, the size runs from 8 to 16ft. Just by looking at this tramp, you’ll quickly realize that it features a total of 6 U-shaped legs. The purpose of these legs is to offer support for the entire unit as well as boost its stability, so it doesn’t get shaky or feel weak when under use. 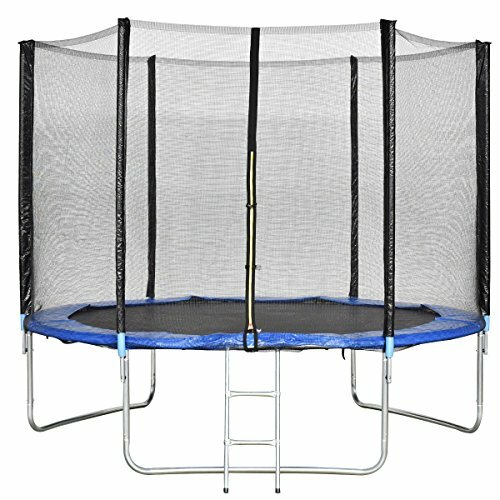 Another thing that puts this trampoline in the same class with other top-rated models is a safety enclosure net. As you already, this netting serves a giant safety measure in the trampoline by eliminating all the gaps between the net and the mat. This feature alone is enough to convince you that this trampoline is safe for your kids. Since it also features solid construction, you can rest assured that it’ll provide your family with many years of fun and excitement. The frame is made of galvanized, rust-resistant steel for longer service life. Adding to the unit overall solid construction are the T-sections which firmly and securely connect the top rails while providing a solid base for the entire tramp. With a large weight capacity of up to 375lbs, this is doubtlessly one of the few models that give kids and adults an opportunity to jump and exercise together. Unlike other models out there, this Giantex equipment comes with all the crucial accessories (including a steel ladder), all at the same original cost. Remember you won’t have problems installing this trampoline, thanks to the included assembly hardware and easy to follow instructions. This is also a top-rated trampoline from Giantex. We noted that it comes in two size options, 12ft and 15ft. It also comes at a slightly higher cost than the previous model. However, the cost difference is acceptable given the extra set of accessories you’ll get in this unit. Most of the features we’ve discussed in the above model are also present here. These include high-quality construction of fully galvanized steel frame and Polypropylene jump mat which make the tramp last a long time. It also comes with durable, rustproof steel legs which are evenly aligned to ensure perfect weight dispersion. This maximizes the tramp stability as well as the safety of the user. 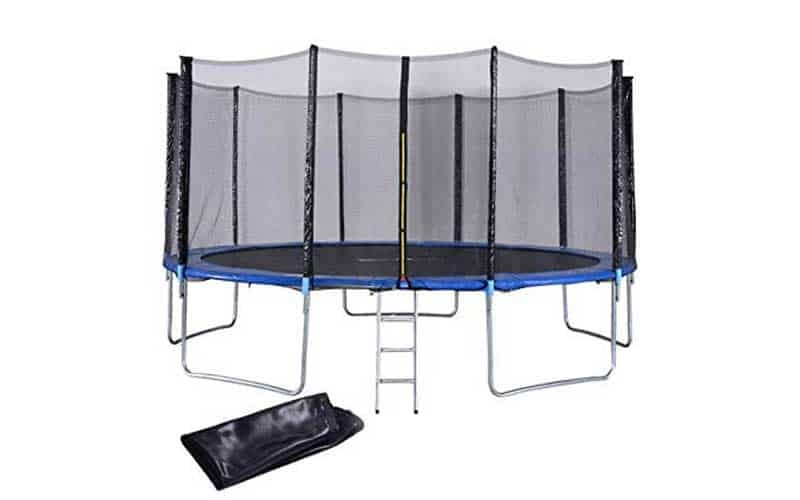 You’ll also find a safety enclosure net in this trampoline, which is also tightly fixed to the galvanized steel poles and the jump pat—completely sealing all the gaps that might turn out to be hazardous if your kids bounce in a wrong manner. It’s also worth noting that this netting is highly visible, so you can always watch your kids as they enjoy themselves. Like its cousin, this trampoline also comfortably accommodates a maximum weight of up to 375lb. This makes it ideal for both kids and adults. The main area where this model differs from the other one is the set of accessories it provides you with. Here, you’ll get ladder and rain cover on top of all the trampoline parts. The included installation hardware and manual will surely make the installation process easy and quick. 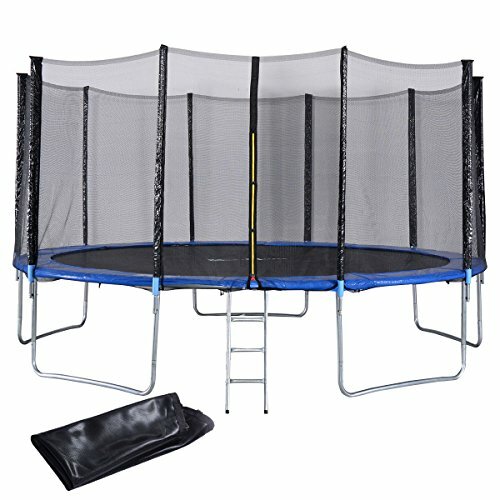 Are Giantex Trampolines Worth It? We found that Giantex trampolines meet all the key aspects that a great trampoline should come with. They offer your family a safe and fun environment, they’re easy to setup (they’ll take an hour or less) and have a solid construction that will ensure a long-lasting trampolining experience. Unlike most brands which offer additional trampoline accessories at an extra fee, Giantex offers you additional accessories at no additional cost. As it’s typical with any other products, the Giantex products haven’t gone without criticism. Nearly all the previous users complain of poor customer support from the company. We hope that Giantex will improve their customer support to enhance smooth communication with their customers. All in all, everything else is good with these trampolines. And I encourage all parents who wish to get a good trampoline for the entire family to invest in them.